Organisations today are facing more talent-related challenges such as ineffective managers, high potential talent retention and non-diverse leadership teams. As a result, an increasing number of organisations are investing in Learning and Development as a priority. Your employees are your most valuable business assets. So what can you do to engage your top talent, help them work smarter, and be more productive? At GBS, we believe that learning is the most powerful tool available to businesses to remain competitive in 2018 onwards. We have adopted the 70:20:10 framework as our learning and development approach. This method employs a mix of experiential, social and formal learning to foster employee growth across leadership levels. Various authors are cited as the source of the 70:20:10 mantra, most often studies at the Center for Creative Leadership, summarised by McCall, Lombardo, and Morrison in Lessons of Experience (1988, Lexington Press). McCall, Lombardo and Morrison were interested in understanding the elements of Executive success. 10 percent from courses and reading. 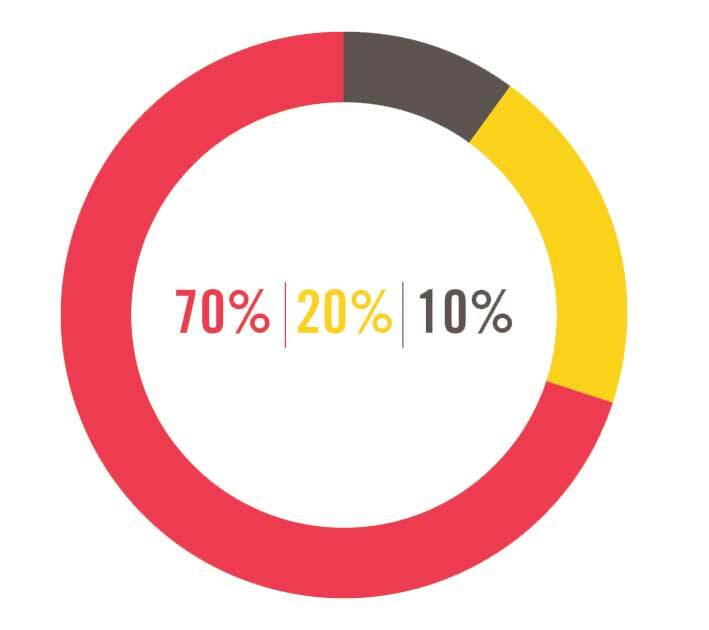 The 70:20:10 model is considered to be of greatest value as a general guideline for organisations seeking to maximise the effectiveness of their learning and development programs through other activities and inputs. The 70:20:10 Model for Learning and Development is now commonly used within the training profession to describe the optimal sources of learning by successful managers. It is effective in engaging your team by making learning immediately actionable. Hands-on experience (the 70 percent) is beneficial for employees because it enables them to discover and refine their job-related skills, make decisions, address challenges and interact with influential people such as bosses and mentors within work settings. The bulk of learning should come from projects that employees face on the job. This may focus on introducing employees to new projects that broaden the scope of their role. They will also learn from their mistakes and receive immediate feedback on their performance. The most successful learning organisations are placing the employee at the centre of their learning architecture and treat learning as a continuous process. The most innovative companies are building internal knowledge-sharing programmes with easy-to-use portals and video sharing systems to promote a collaborative learning experience. The more confident a learner becomes, the more they will seek out learning opportunities and ways in which they can share ideas with other learners. The key to implementing the ‘20%’ is to give employees the support they need to carry out the ‘70%.’ Employees learn from others through a variety of activities that include social learning, coaching, mentoring, collaborative learning and other methods of interaction with peers. Encouragement and feedback are prime benefits of this valuable learning approach. The 10% of professional development optimally comes from formal traditional courseware instruction and other educational events. The GBS Way outlines how we design and drive our programmes. It is a simple three-step process of Listen – Solution – Implement. Listen: at the start of our process, we listen to you carefully and evaluate your requirements. Solution: Once we have gained an in-depth understanding of your needs, we design a bespoke learning package tailored to your business requirements. Implement: We embrace the 70:20:10 model of blended learning. Our solutions aim to achieve real behavioral change within your organisation that extends far beyond the classroom. 1.We help you create a true alignment between your business and your learning strategies. 2.The solution successfully delivers on your specific objectives. 3.Your employees gain access to subject matter expertise. 4.We devise blended solutions utilising the most effective and relevant training media for your business. 5.Using the 70:20:10 model, we define the right intervention that will suit the needs of your individual employees. GBS Corporate Training is a leading provider of Management and Leadership training, offering a variety of training courses in all related subject areas. GBS offers flexible programmes created specifically for your organisation. GBS will tailor course content to accommodate your unique business needs or to address skills shortages in your organisation. We can also incorporate content covering the full syllabus of one or more qualifications from the Chartered Management Institute (CMI), The Institute of Leadership & Management (ILM) or the Chartered Quality Institute (CQI). Through this approach, you can be sure your employees are gaining new knowledge and skills that will be relevant to your company and can also lead to a qualification. GBS has also developed the ‘Flexi-Day’ concept of training, so that we can put together a day of training on a subject of your choice. The day of training is entirely driven by your needs. To make up a Flexi-Day, you can select three subjects and we would deliver a 90 minute classroom-based session on each. Delegates would only attend the course or courses that are relevant to them. If you have delegates who need more in-depth training on a specific topic – we can do that too! In this case, we would put together three modules that focus on three key areas of that specific topic. Coaching is one of their most essential leadership skills, and an effective way to enable teams to deliver extraordinary business results. Whatever a person’s role in an organisation, coaching will help to develop their potential and work performance, and is seen as a key ingredient in improving employee engagement. It can also be a good way to reinforce learning and help employees to apply theoretical knowledge-based learning acquired from formal training (the 10%). Whether you are looking to train to become a professional coach or gain a qualification in coaching; or you simply want to learn the basic principles of managerial coaching, then GBS can help you. As well as learning on the job, GBS believes that learners should be enabled to undertake their own development by providing access to resources, tools, and connections that will empower them to do their jobs and build their careers better. When our clients undertake training through GBS, they will instantly have a variety of learning resources at their fingertips. We provide access to online learning platforms, where they can view written and video content, tailored to their career development needs. For example if you enroll on one of our leadership or management courses, accredited by the CMI, you will gain access to ManagementDirect- the CMI’s unique online multi-media knowledge base. As with the 70:20:10 method, the GBS approach is flexible based on your company’s leadership and management training needs. However you choose to apply it, we will make sure to create an immersive learning experience for your staff. You’ll grow employee productivity, increase retention, and improve your business objectives as a result. You can find out more about flexi-days as well as our bespoke blended learning provision on the GBS Website.